Parabellum guarantees a smooth quiet ride or your money back. 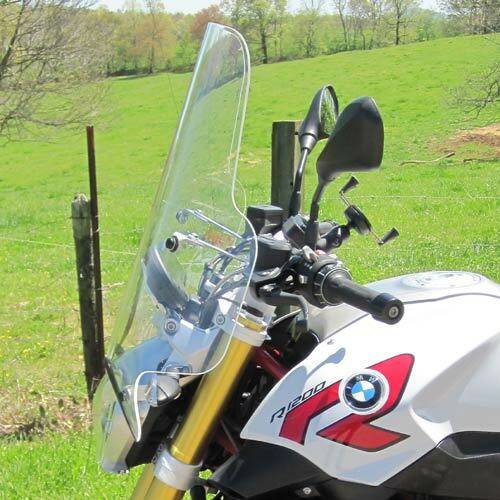 Here’s how we do it: The R1200R has a wide handlebar, but the OEM windshield mount dictates a narrow windshield. The result is buffeting and turbulence on the rider’s head, shoulders and arms. After testing various curves, widths and angles, maximum protection was realized by replacing the plastic OEM mount with our wider stainless and aluminum mounts. Our Super Tour screen for the R1200R provides optimal protection when compared to anything else on the market. 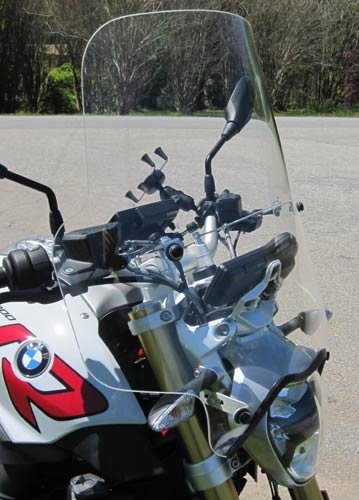 The R1200R Super Tour windshield is manufactured in the U.S.A. using 3/16 in. high molecular density military type cast acrylic for non yellowing optical clarity. The shield measures 22 inches wide (16 inches at the top) and is offered in several heights and clear or tint with hardware included.